Jody B. Miller is currently CEO of C2C Executive Search & Strategic Management, a corporate job placement and employment consultation firm, which puts her in contact with thousands of people and their stories. Jody was previously Assistant Producer of the award-winning PBS series Traveling Lite, which ran weekly on 187 public television stations and reached tens of millions of people. Jody also created and hosted the cable TV series Living Young. Jody’s prior positions include being the founder and President of Ceres Ad Systems, a media technology company; a Marketing Executive for CBS Television in New York City; a Strategic Growth Consultant for Fortune 500 companies such as IBM and The Williams Companies; an Investment Banker for Pacific Crest Securities, a technology focused investment bank; and co-founder of Dedication To Special Education, a nonprofit that raises money for Special Ed K-12 kids. Miller is a regular contributor to Ignites Financial Times Magazine, which reaches over 89,000 weekly readers. She has also contributed to Defense News (Produced by Gannett Government Media), with a weekly circulation of 37,000. She is also a guest blogger on Huffington Post (http://www.huffingtonpost.com/jody-b-miller/). Miller has written articles about job satisfaction, work/life balance and finding meaning for “Pulse,” the news and insight feed for members of LinkedIn, a professional social media network with membership of 364 million. Jody graduated from the University of California at Santa Barbara with a dual Bachelors degree in Communications and Sociology. Her education gave her additional perspective as to the many ways we communicate with ourselves and with one another in our search for happiness and meaning in life. She has also taken courses on creativity from The Venture Lab at Stanford University. Her curiosity and engagement in the world around her drives her to hear and write about people’s stories - stories that challenge, inspire and transform. SHIFT gives the reader the ability to do just that – to shift their perspective and live a life of true meaning and happiness. Jody lives in Marin County, California, has three wonderful children who are as varied as life itself, and a sweet Shih Tzu named Bailey. can you add in that I am a guest blogger on Huffington Post? Chatham Ross has no time – for anything, least of all love. She manages her three kid’s demanding schedules, exercises at crazy hours to preserve her less than perfect figure and writes catchy advertising jingles to pay for the mortgage. To the outside world, she seems to have it all - except for a husband. Who has time for that? Besides, hers died unexpectedly five years ago and she’s still not over it. A chance occurrence with a particular jingle finds Chatham on a bi-coastal roller coaster that she can’t seem to put the breaks on. Will the man who has always secretly loved her finally have his chance to ride along? Or will the very handsome foreigner on the other side of the country claim her wounded heart? At some point she has to choose which path is for her - or has it been there all along? HIRED! is a practical guide for all job seekers who wish to secure their dream job. Written by acclaimed Wall Street Recruiter, J.B. Miller, HIRED! provides behind the scenes secrets and tactics that will help every job seeker, regardless of industry. Miller's goal is to get a minimum of ten million people worldwide hired into their dream job. ​Do you do what you love and love what you do? In HIRED! IN 2017, you will find the blueprint for finding what you love. It will help you land your dream job in 2017. 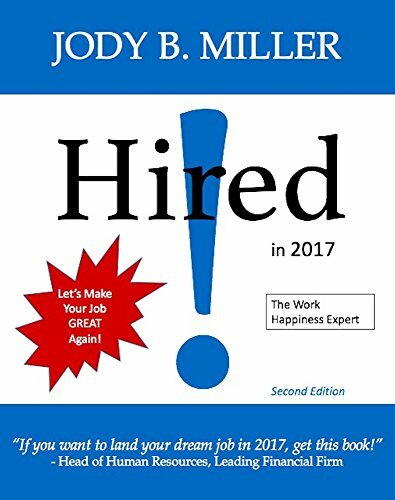 Written by CEO, Life/Coach and Executive Recruiter, Jody Miller; also known as The Work Happiness Expert, HIRED! IN 2017 is a get-to-the-point guide. No fluff; only resources and relevant tips that will help you get to the front of the hiring line. Isn’t it time you invested in YOU? We all desire to be happy in our work and in our personal lives, and we want to be valued for who we are. But the world is filled with rejection, disappointments, and pressures that too often cause us to pull back, settle for much less than we want, and become a pale shadow of our authentic selves. If we decide that the success we yearn for is unattainable, then we reconcile ourselves to mediocrity. This is not good. It’s a slow professional and personal death spiral. 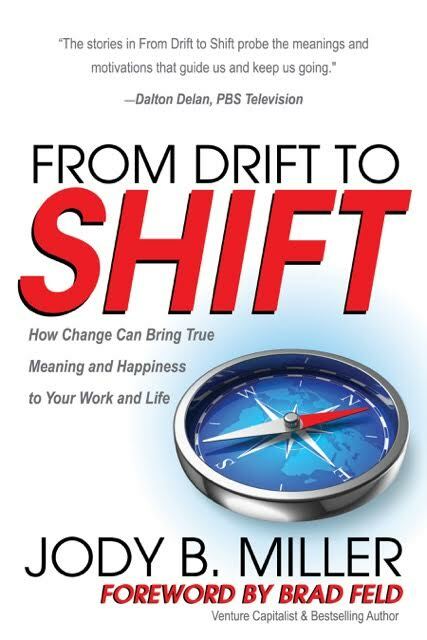 In my book FROM DRIFT TO SHIFT, the reader learns to recognize the opportunity to pursue life’s true purpose and to embrace it both professionally and personally. When they do, they realize that profound success, down to the core of their soul, is achievable. FROM DRIFT TO SHIFT encourages us to seek a life of meaning, to have the courage to be who we really are, and to not let external forces pressure us into being less than we are.